Hyperpigmentation is a common challenge in the treatment room, but how exactly does a spot or demarcation form? There are a variety of factors that contribute such as: overall health, stress levels, sun exposure, medications, etc. A breakdown of the process may help shed some light on the issue. Approximately one out of every eight cells is a melanocyte. The cells produce melanin – an action that occurs in the granular layer. This is a natural and necessary process, as pigments provide skin color and a unique defense system against UV radiation. 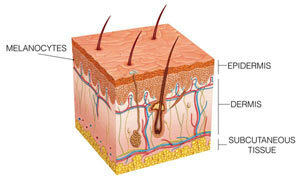 The epidermis is primarily made up of skin cells, which create a protective layer. A trigger (such as UV exposure) sends a signal to melanocyte-stimulating hormones that the skin is in need of protection. This activates the enzyme tyrosinase. After tyrosine is signaled, the melanocyte cell receives a message to produce pigmentation (melanin). The melanocytes make melanin, bundling them into melanosomes. These melanosomes are then dispersed upward through the granular layer via dendrites to keratinocytes, where they form melanin caps, which reduce DNA damage caused by UV exposure. Common triggers may include: the sun, inflammation, injury, hormonal changes, friction, medications, aggressive skin care products, an even acne (in the form of post-inflammatory hyperpigmentation). In healthy conditions, the pigmentation produced in response to potential damage will eventually diffuse or fade on its own, but in some cases, a permanent discoloration may occur. As the skin ages the pigmentation cycle is less controlled. DNA damage to the skin cells may result in the steady distribution of melanin. As excess melanin is produced, and disbursement is interrupted, hyperpigmentation forms. This creates deposits of color that stay indefinitely unless treated. Bellis perennis (daisy) flower (daisy flower). This gentle, natural brightener is derived from daisies. Arbutin (L). 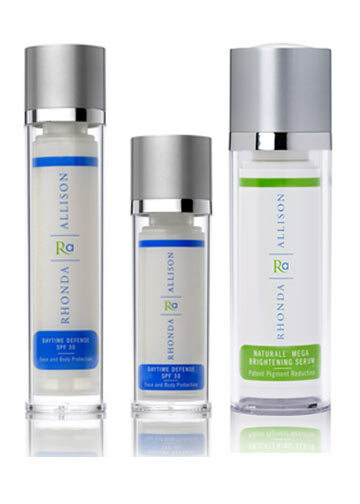 This natural plant-based derivative of hydroquinone (HQ) has tyrosinase abilities. Since it is typically more stable and less sensitizing than HQ, it is a great alternative for those with sensitivities. Kojic acid. Derived from Japanese mushrooms, kojic acid works to effectively inhibit melanin synthesis. Lactic acid (L). This keratoyltic AHA has natural brightening abilities, works to smooth skin and improves texture. Azelaic acid. This grain- and yeast-derived compound helps normalize disordered cell growth, provides antioxidant and anti-inflammatory support and helps effectively treat acne-related post-inflammatory hyperpigmentation. In addition to corrective and skin-building ingredients, supporting the skin’s overall health will also be essential in properly controlling pigmentation. It’s when DNA damage occurs, that pigmentation becomes an issue. Regular exfoliation, nourishment and protection with a good mineral- based sun protection will help keep pigmentation issues at bay.